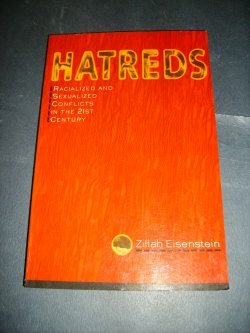 In HATREDS, Zillah Eisenstein charts the plural politics of the twenty-first century, which she defines as having begun with the fall of communism and the gulf war. Exploring the politics of hate on both global and local levels, Eisenstein tracks developments such as racialized ethnic and gender conflict, the new male democracies of eastern Europe and the new Democrats of the Clinton era, the sexual exploitation of the west and the sexual violence of nationalisms, and the importance of western feminisms' promissory standpoint of freedom to women in the third world. 223pp. N.B. Previous owners inscription to ffep. Small amount of underlining.